January 16, 2012 - 1991 Penny. Showed the blog to a friend today. He is someone I've known for approximately half my life. He too is a techy and photographer, someone whose opinion I value. He took a read through the blog and pointed out a couple things. First - my critiques sounded defensive. I'm not sure I can argue that without, uh, sounding defensive. I'm not sure I'm even going to try. Part of what I'm aiming for here is a collection of my notes and thoughts on the pictures I take, even if it turns out to be public navel gazing of a sort. I am, for the most part, fine with it - though will perhaps try to turn things around a bit and write more on why I chose a particular image, rather than the things I could have done better, but didn't. He's right, it is defensive, though I do plan to continue sharing some of my thought process. His next point was perhaps the more important - he asks for more on the thought that went into creating the image. Why did it mean enough of something to capture, process and post? What story is there to tell, rather than the bland tech behind it and the self serving critiquing after the fact. And, this brings us to tonight's photo - a penny worth of my thoughts. It seemed appropriate, if trite, while I was mulling my friends input. 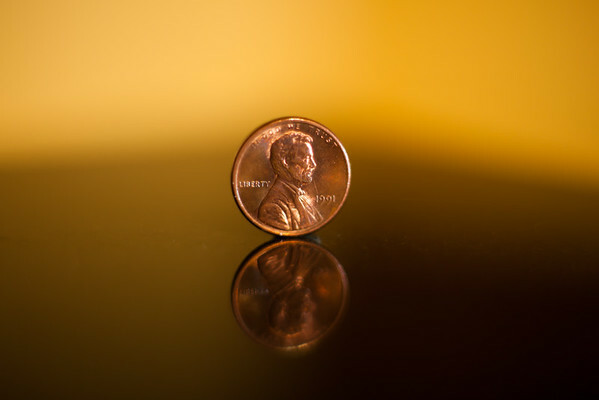 This penny may be about as much as the image is worth - but it is today's story. I do need to think a bit more about what is going into my pictures, rather than just firing away and then posting online. My point here with this blog was not just to take a picture a day, but to get better at doing doing so. Part of getting better is the technical parts, but a larger part is the story and the narrative behind why the picture was worth taking. This frame was shot with the 5dII and 50mm f1.4 lens, plus a Canon EF 12 II extension tube. Lit the scene with a halogen floor lamp, up and to the right, plus a 430EX flash right and just about level with the penny. Exposure 1/200th at f/1.4. ISO 100. The penny itself is stuck with a bit of gaffer tape to a piece of black granite tile, purchased from the local Big Box home improvement store. I tried bouncing the flash off the wall, from underneath, but was't getting quite the relief I wanted on the coin. What you see above is was the last shot in the series. I started with the penny clamped in spring clamp used previously, resting on a small couch-side table. I fired a couple shots of this, but thought the clamp cluttered the picture and was holding the penny too close to perpendicular. I next moved to leaning the coin against a small roll of gaffer tape, firing a couple more shots. That improved both the angle and the colors (black, vs blue) - but still created too much background clutter. Remembering I had a handy roll of gaffer tape, I folded up a small bit and used it as a stand, affixed to and mostly out of site behind the penny. Couple more frames, and I'm feeling like its getting closer. The table itself had some texture, it is wood with a rough slate tile top. Remembering a trick noted in David Hobby, aka The Strobist's blog post on shooting a shiny new gadget from 2006 (wow, has it been that long??) I dug out my black granite tile and stuck the penny to that. 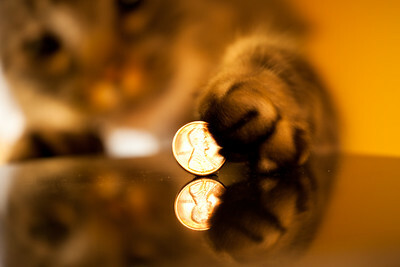 Also added the flash underneath the table, pointed at the wall behind the penny. I shot a few more frames, trading lenses a couple times to get a tight macro view of the coin. I ended up with the 50mm and extension tube. The final adjustment was to move the flash off to the right, sitting on the arm of the couch, aimed at the wall. This helped pick up the relief on the coin - you can see the high-lights on Lincoln's face and jacket, as well as on the edge of the coin and in the lettering.